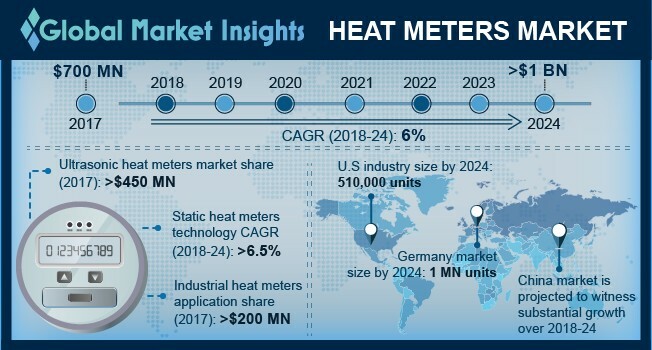 Heat Meter market size will exceed USD 1 billion by 2024, as reported in the latest study by Global Market Insights, Inc. Accelerating investments toward the development of sustainable heating technologies along with ongoing expansion of residential and commercial establishments will foster the heat meter market demand. Favorable regulatory policies pertaining to energy efficiency along with rising concern toward carbon emissions will further stimulate the industry growth. For instance, the government of Canada signed the Copenhagen Accord in 2009 and the Paris Agreement under its climate action plan to reduce GHG emissions by 17% by 2020 below 2005 levels. Static heat meters market is set to grow on account of growing adoption of advanced and automated building technologies along with rapid expansion of commercial and industrial establishments across the emerging economies. Accelerating demand for trigeneration technologies along with high data precision recording mechanism will positively influence the product growth. High durability, low energy consumption, data accuracy, and long-term stability are some of the key features which will stimulate the vortex heat meter market share. In addition, the increasing investments toward development of service sector across the European economies will positively influence the product penetration. Effective measurement of heat consumption along with low maintenance cost owing to non-movable parts will further fuel the business growth.